Churchyard Brewery: Churchyard Brewery Hosts 2nd Tasting! Churchyard Brewery Hosts 2nd Tasting! I couldn't have dialed up a better day if I had tried. Perfect weather, skies were blue, air warm. And all gathered around a table full of ten different beers from four local brewers. Yesterday, Churchyard Brewery hosted it's second tasting event. Unlike the first, however, this tasting featured three other local brewers as well: Michael Duncan Smith (brewmaster of both The Tippling House and Minuteman Brewery), Nicholas Magelhaes, and Patrick Doyle (Doyle Brewery). A highlight for me was being able to do a vertical tasting of three different versions of NocturnALE. This was a beer I had brewed some time ago in collaboration with Sillas from Barismo Coffee in Arlington. I brewed three different versions of the same porter, but altered the coffee infusion methods for each: one was brewed with the coffee steeped in the mash, one with coffee grounds added to secondary, and one with coldbrew coffee added to secondary. The coldbrew NocturnALE was the generally agreed upon winner. Perhaps my favorite of beer of the ten was the Montrose Scotch Ale. 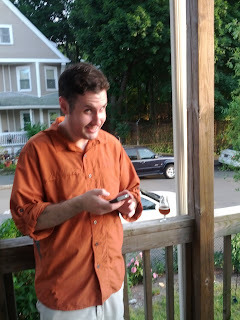 Mike had added a small amount of cherry smoked malt, and that really came through in both the nose and mouth. Unlike a peat smoked malt, this malt lent a light fruity smoke flavor that made it a tremendously compelling beer. And despite the high ABV, there was little hint of booziness; it went down quite well! There were two waves of people: about a dozen or so people came from 4-8, and then a second wave of another half dozen came around 8 until 11. Many thanks to all who came out and brought food and snacks! I'm already looking forward to the next Churchyard tasting event. If everything goes according to schedule (but does that ever happen? ), I'm aiming to have another in October. Check back for details!